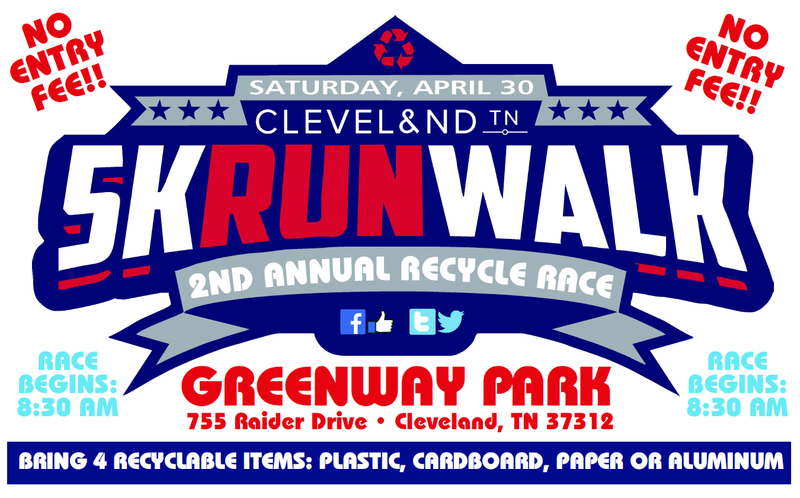 The City of Cleveland is hosting its second annual Cleveland Recycles 5K Run & 1 Mile Fun Walk. The goal of this event is to raise awareness about the benefits of recycling and reduce liter in the community. The selected course takes you along the Cleveland/Bradley Greenway, which provides a safe and scenic route through the city. The course is USATF certified. Each participant will receive a t-shirt, reusable grocery tote, and other prizes. Water will be provided along the course. Snack bars, fruit, bagels, and juices will be set-up at the staging area. A certified and licensed massage therapist will also have a table available at this event. Awards will be given for overall (M/F) as well as 1st, 2nd, and 3rd place for the following divisions: 10 and under, 11-14, 15-18, 19-24, 25-29, 30-34, 35-39, 40-44, 45-49, 50-54, 55-59, 60-64, and 65 and up.